Bonnie and Clyde were meant for each other. And they clung to each other while they fought back against the elements. These elements were destitution and a government they took for its face value. They were children of a nationwide economic depression that not unlike France in the late 1700s had its upheaval--and those who tried to keep small the size and impact of the upheavals. While they terrorized banks and store owners in five states--Texas, Oklahoma, Missouri, Louisiana, and New Mexico--Americans thrilled to their “Robin Hood” adventures. The presence of a female, Bonnie, escalated the sincerity of their intentions to make them something unique and individual--even at times heroic--and above similar activities of all-male motor bandits like John Dillinger, “Baby Face” Nelson and “Pretty Boy” Floyd. Estimates of the ammunition emptied into that Ford sedan vary from 130 to 1,500 rounds (the latter being most dubious). The film embedded below, supposedly taken “by an amateur photographer five minutes after the shooting,” gives you a pretty clear idea of the violence involved in the ambuscade. In recent years decades, Gibsland has become home to a well-touristed Bonnie and Clyde Ambush Museum, particularly popular with families, we’re told. 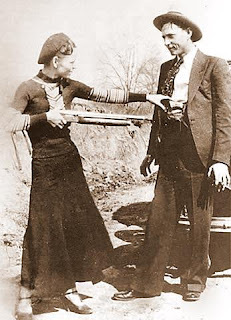 And every year, that town of just over 1,100 people hosts a Bonnie and Clyde Festival--the latest version of which began today. With a new big-screen feature about the “rogue Romeo and Juliet of Depression America,” this one headlined by Hillary Duff and Kevin Zegers, set to begin filming in central Louisiana in late July, one can only assume that Gibsland will have even more to celebrate next year. READ MORE: “Adios, Bonnie and Clyde,” by Thomas Pluck (Criminal Element); “Bonnie and Clyde Redux: The Year of the Gangster, Part 3” (U.S. Federal Bureau of Investigation). Was hearing about the fest on WWOZ (great Louisiana station available online). The DJs seemed to be having fun with the idea.